The Historic Columbia Highway turns 100 years old this August. It is not an exaggeration to say this is a truly beautiful looking highway. 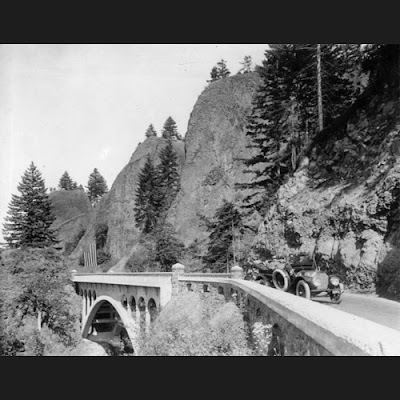 Currently The Oregon Department of Transportation is working to reconstruct the highway, which was the country's first scenic highway. Although only 10 miles remain for the reconstruction it is still a huge task. Learn more about The Historic Columbia River Highway below. The Historic Columbia River Highway runs through the Columbia River Gorge from Troutdale to The Dalles. It was built in segments and dedicated in 1916 as the nation's first scenic highway. It functioned as the main road into Portland from the east until opening of I-84 in the 1960s. These days, the Historic Columbia River Highway is used predominantly for hiking and cycling, with some sections still accessible to cars (including the Troutdale to Crown Point and Multnomah Falls section). When completed, the Historic Columbia River Highway State Trail will span 75 miles and will serve as a scenic and alternative bicycle route for I-84 between Portland and The Dalles. Five of the 10 missing miles have been funded. Construction will begin in September on the Shellrock section, followed next year on the Wyeth section. That still leaves a proposed five-mile, $32 million project on both sides of Mitchell Point, just west of Hood River, to complete the route between Portland and The Dalles. Funding is still needed for that project.